Z. spina-christi is spiny shrub or tree up to 10m in height. On wet sites it is an evergreen but it looses all it leaves during the dry season. The species is long living. The bark is grey-brown, when cut at the edge it is reddish, matured bark is grooved and cracking. The paired spines are ‘thump pointer’, the straight thorns long and thin. Its branches are intertwined and yellow-white in colour and form an impenetrable thicket. Flowers are small, 10-25 in number besides leaves, yellow-green in colour, stalks and calyx hairy white. Fruits are yellow and ~2cm in diameter (see picture below), when dried the colour turns reddish. Fruits are edible. They are eaten raw. Too much consumption of the fruit creates dryness in the stomach. 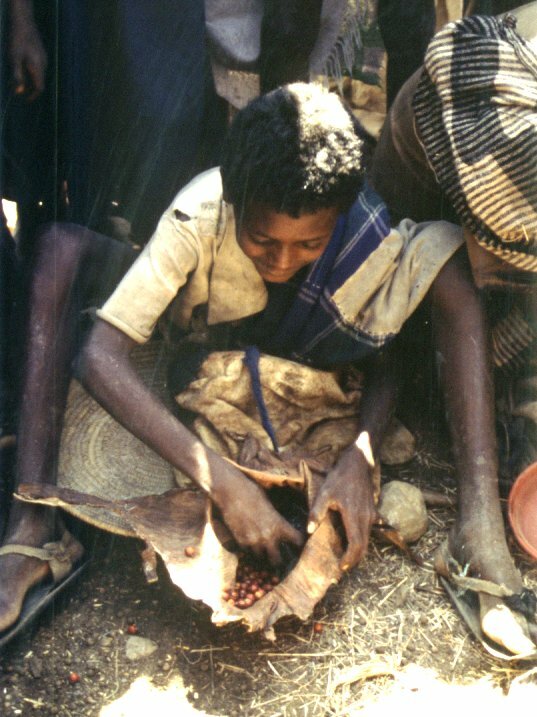 The fruits are marketed in Wag Hamra and Jana Mora Woredas. 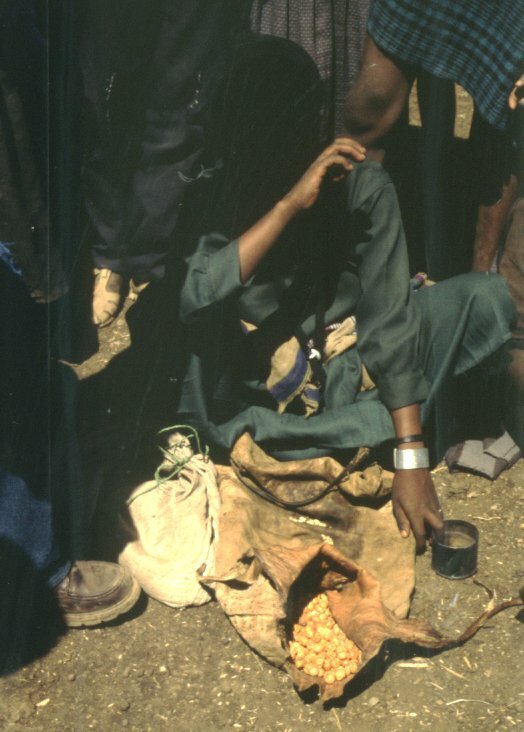 In the latter place, the fruits are brought from the Tekeze River lowlands up to Mekane Birhan, the Woreda capital of Jana Mora. Fruits of ziziphus species contain an extremely high vitamin C portion: Oranges contain ~ 57mg/100g, whereas ziziphus species contain up to 1000mg/100g (Grosskinsky, 1999: p. 23). The plant grows in the dry and moist lowlands and is common in wooded grasslands, on flooded riverbanks, and edges of cultivation. The plant prefers alluvial plains with deep soils (0 - 1,900m). Propagates by seedlings and cuttings. The species coppices well. It develops an extremely deep taproot system and can make an impenetrable thicket. The wood makes excellent firewood and charcoal. Leaves are also given to animals as fodder. 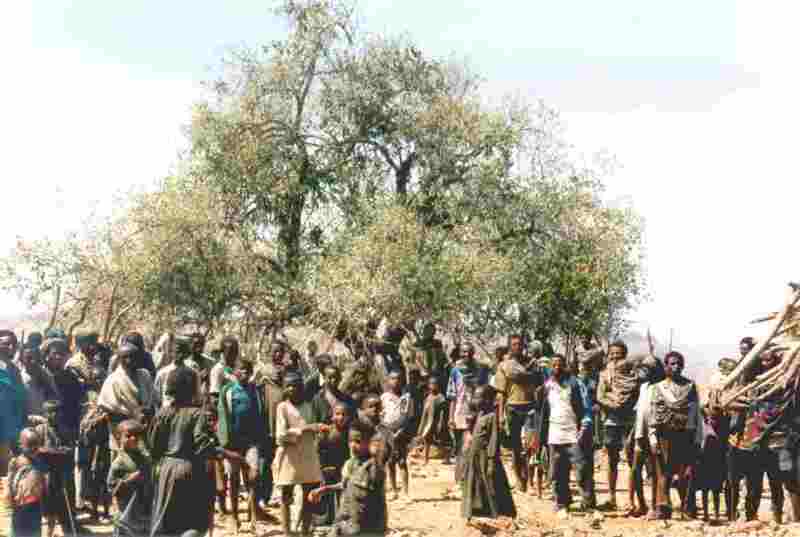 Z. spina-christi tree in Arba Zekuar village, Belessa Woreda, North Gonder, February 2001. Marketed Z. spina-christi fruits; dried fruits left and fresh fruits on the right picture.